While I wasn’t working last year, I accompanied my now retired Dad to his gig at Open House (http://www.openhouse.org.au/). I asked Dad what he was doing, why and why he thought it was important. Dad - Getting kids, currently having trouble at school or home, to re-focus their lives by practical work and being around positive role models. We start with hello and a handshake, then exercise via fun games. At lunch, it’s a chew and a chat, and at work it’s building, carpentry/joining, and mechanics. Dad - According to the kids – YES! Many have indicated a better overall interest in school. The adults get a great sense of achievement also, and a connection to the youth of the community. The strength of rapport is obvious. We get to learn as much about ourselves as the young men do. 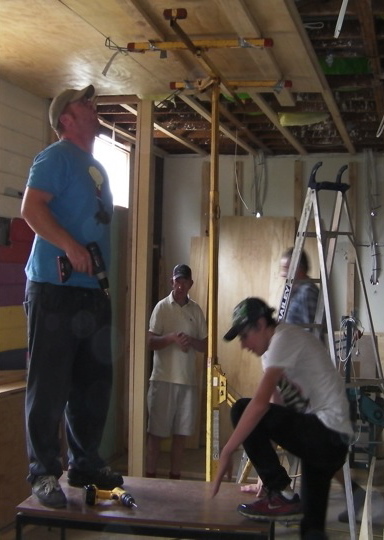 And all while picking up some valuable building skills to use in our house renovation!